Green beans with mustard butter sauce is a quick and easy side dish with rich, tangy flavor and only 5 ingredients! 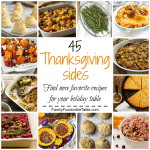 T-1 day until Thanksgiving – are you ready?! Usually, we spend the morning at the turkey trot, then come on back and get the turkey going. If we’re lucky and have things well-timed, we like to step out midday to take the kids to feed the ducks or play tennis (aka running after balls) on the tennis courts nearby or even head to the playground or take a boat ride, as long as someone stays back by the oven. Then my mom and M, my 5-year-old, work together to set the table. My mom is kind-of a master at tablescapes. I didn’t inherit that gift, but maybe it’ll skip a generation and M will have the gift. But on to today’s recipe! 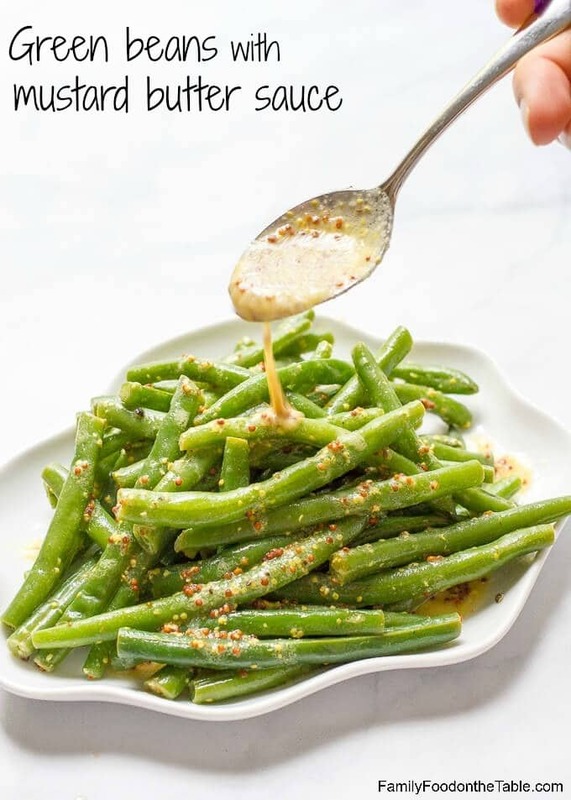 Green beans with mustard butter sauce is one of those easy go-to side dishes when you need something tasty but don’t want to fuss over another part of your dinner. Know what I mean? You’ve looked up a recipe for your chicken, you’ve shopped for the ingredients, gotten everything prepped and now you need some sides. Happens to me ALL. THE. TIME. Which is why we eat a lot of microwave baked potatoes. Nothing to do but scrub, poke with a fork and cook in the microwave. We also eat a lot of simple spinach salads and steamed broccoli. Fuss-free. I like cooking the green beans for this dish until they are tender, but not mushy. If you want yours completely soft, just add a few more minutes of cooking time. (And check out my sautéed green beans and tomatoes, which are slow cooked until totally soft). 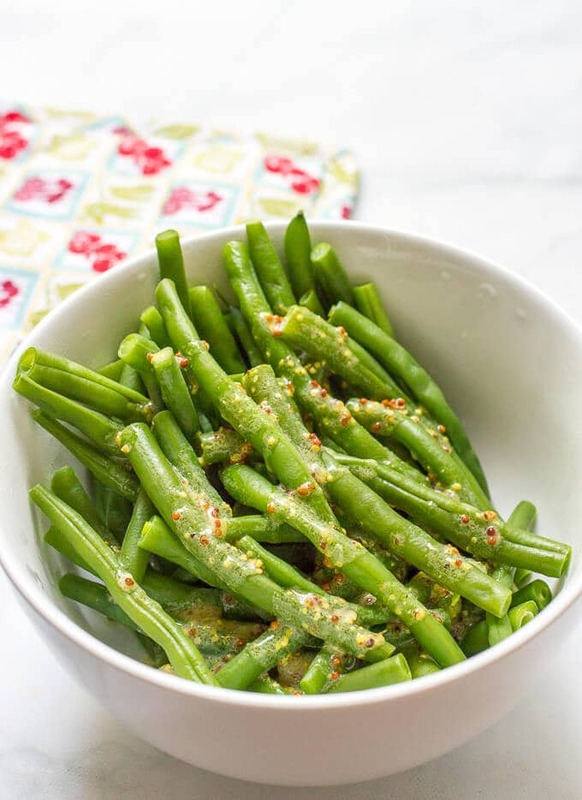 I like that these green beans are a bit tangy, but you can certainly add a teaspoon or two of honey if you want to sweeten this up a little. You can substitute olive oil for the butter if you’re vegan or if you want the sauce to be more of a vinaigrette. I like the texture and flavor of the whole grain mustard, but if you don’t have any, you can use all Dijon mustard here. 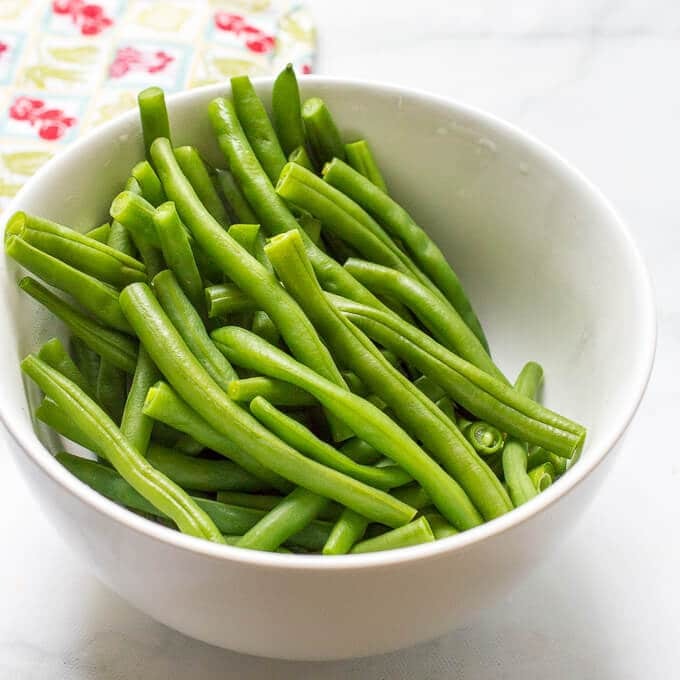 These green beans would make a great addition to your Thanksgiving table tomorrow, especially for how simple they are amid all the other elaborate dishes we all tend to make for the big meal. And really, who couldn’t use another side dish?! P.S. 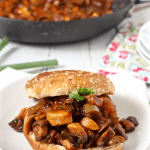 I’m not going to post on Friday this week, but I’ll be back next week with some more delicious recipes! 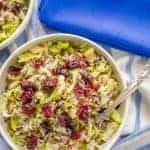 Sign up here if you would like to be added to my weekly e-newsletter (+ get my FREE e-book with 10 easy weeknight dinners). 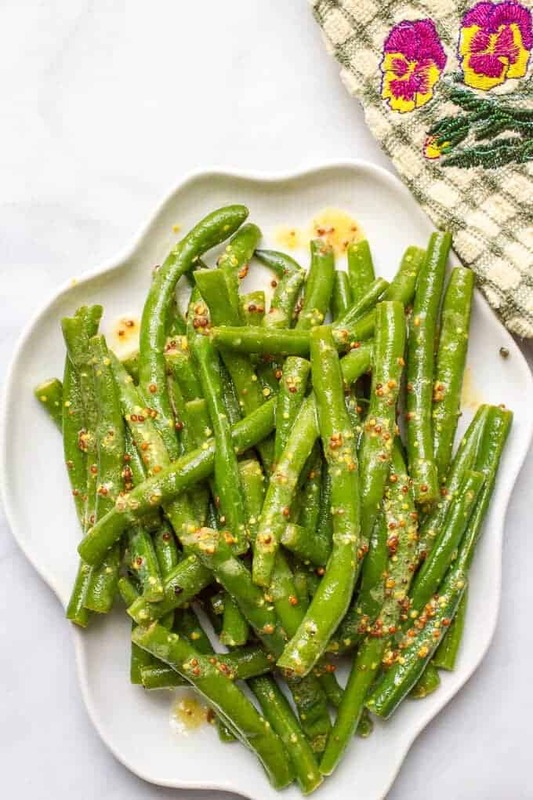 Green beans with mustard butter sauce is a quick and easy side dish with only 5 ingredients! Cook green beans in boiling, salted water until crisp-tender, about 5 minutes. In the meantime, combine the remaining ingredients in a medium bowl and stir to combine. Drain the green beans, then add to the bowl and toss with the mustard sauce to coat. Serve immediately. That sauce sounds wonderful! Bless you for going to the store the day before a major holiday! Madhouse! We went early Rebecca, before the crowds 😉 My mom and I split up the list and each filled a cart – in and out and now we’re cooking! Happy Thanksgiving! I love green beans! Looks like I found a new way to prepare them. Thanks for sharing!!! 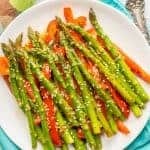 What a wonderful twist on an every day veggie, love it! I also love the towel your Grandma made – what a precious treasure! Aww, thanks so much! It is so special to me! 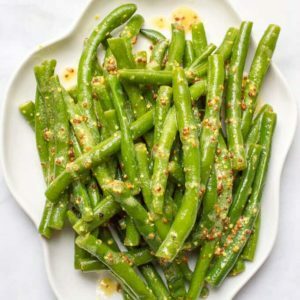 Saute raw green beans in browned mustard garlic butter and skip blanching yadda yadda. Sure Tom, you could certainly make it that way instead. I’m not usually a fan of folks who make major changes in a recipe and then review it, pro or con, but now I’m going to be one of those people. I made the sauce and it was a little tangy for me, so I tossed in a dollop of honey and a tablespoon or so of cream sherry (really) and it was soooo good. My boyfriend has been bugging me for more every day since. 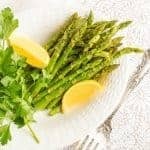 It will be a regular in my repertoire and I intend to put it on asparagus, broccoli, potatoes and anything else I can think of…maybe pork chops! I’m so glad you enjoyed it Rose and those sound like delicious additions! This recipe looks delicious! I want to make this with chicken and baked potatoes. What flavors for chicken breast do you think would pair well with this recipe? Sounds like a yummy dinner! 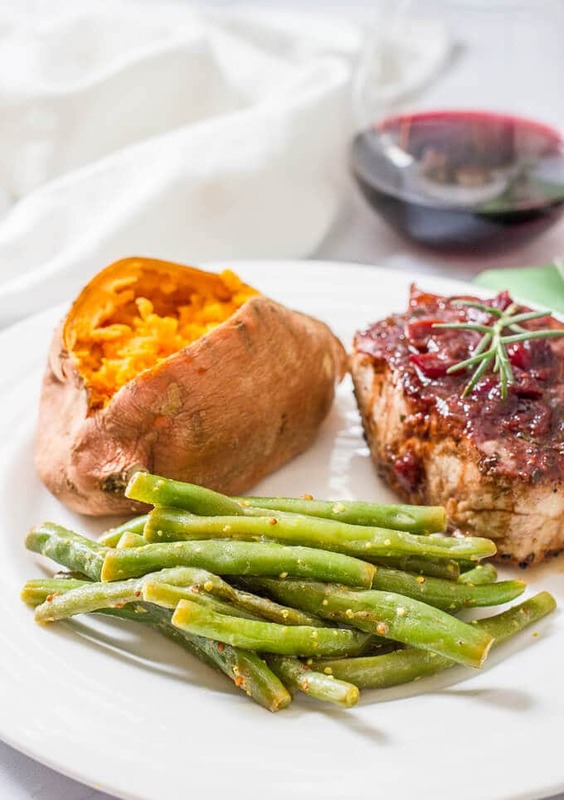 You could do a balsamic flavored chicken (https://www.familyfoodonthetable.com/slow-cooker-balsamic-chicken/) or a creamy or cheesy-style chicken (https://www.familyfoodonthetable.com/healthy-creamy-italian-chicken-skillet/ OR https://www.familyfoodonthetable.com/easy-mozzarella-baked-chicken-2/) Hope that helps! Thank you so much. The Creamy Italian chicken was delicious! 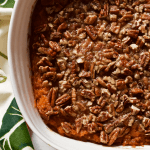 Do you think that recipe could be adapted to the instant pot? I’m so happy you enjoyed it! I’m sure it could be, but I JUST finally bought an Instant Pot myself (I know, I’m so behind), so I don’t yet know how to convert recipes.